Want to learn how to play table tennis? 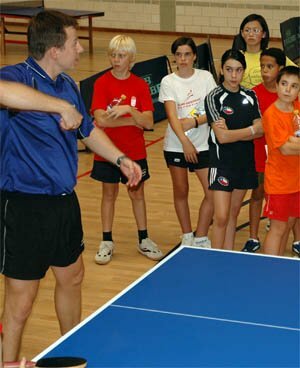 Learning to play table tennis for fun is easy ... but learning how to play to a high standard requires much more than just learning the rules of the game. By the way, if you don't know the difference between table tennis and ping pong you can find out here. I've been playing since 1971 and I've built up a wealth of knowledge about the game which I'd like to share with you. And as it's truly is a sport for all - whatever your age or physical attributes, you can play too. So let's take a look at the basic skills you'll need, and then we'll move on to some of the more advanced techniques. I started learning how to play table tennis at a young age. I was still at school at the time and I always tried to play whenever and where ever I could. I played at school, at the local youth club, at the YMCA and at home with my sister at every opportunity I had. I was also very fortunate because one of my teachers at school was very keen on the game and she organised an after-school club where she encouraged me to learn how to play correctly. I'd highly recommend that you try to get some good coaching as early as possible in your playing career as this'll give you a solid foundation for your game - and it's vital if you're going to play at an intermediate or advanced level. Even if you start playing the game when you're a bit older, coaching is invaluable. Having said that though, if you're only going to be playing a friendly game with your buddies, just learning a few of the basic skills will probably be enough. I managed to find a junior coaching program which was only a short bus / car journey away from our home. The junior coaching sessions were held on Monday, Wednesday and Friday evenings and I joined up as soon as I could ... and pestered my mum and dad to take me to at least two of the sessions every week. The coaches had a good reputation and they'd been coaching for a long time, producing many talented players along the way. As with any sport, mastering the basics is essential - and table tennis is no exception. But first you'll need to know which racket (paddle / bat) is right for you, particularly if you're a beginner, and you'll need to know the correct way to hold it (the grip). The grip is probably the most fundamental technique to master when learning how to play because, just as in other sports, if you don't use the correct grip when you first start playing, you'll find it extremely difficult to change later - and you'll be unlikely to improve beyond the level of a beginner. We'll then start by taking a look at the Ready Position before moving on to basic ball control and the 4 basic strokes. When you know the correct stance required for each of the 4 basic strokes, you'll be able to practice these strokes and techniques in order to provide a solid foundation for your game. Next, we'll take a look at the basic service rules and how to serve in accordance with those rules, and the basic principles of how to return the service. Finally, we'll take a look at the footwork patterns you'll need to practice. In this advanced skills section we'll take a look at how to master spin. Mastering spin is an essential element of advanced table tennis and will determine your ability to play to a higher level. And finally we'll take a look at the advanced serve and advanced return of serve, including the Flick (Flip) return. It's important to remember that before you can implement any strategies or tactics, you'll need to develop your own table tennis skills to a sufficient standard. For example, you must be able to keep the ball in play for an extended period of time and be able to direct the ball to different positions on the table tennis table. If you're unable to play certain strokes, or you don't know how to counteract your opponent's spin, then you won't be able to fully implement a good match strategy. But you will still be able to use certain principles in order to outwit your opponent. However, if you're playing against a player who is at a much more advanced level than you, then it is unlikely that any strategy you employ will be effective, because of the difference in playing standard. But if you're playing against a player of a similiar standard to yourself, even if they're slightly better than you, you can use a good strategy to beat them. I've also put together some practice drills for you, together with skill tests and warm-up exercises which you'll need if you want to improve further. As with any sport, practice, practice, practice is the key. Having a good practice partner or using a robot (ball launcher) is essential if you're going to "groove" your strokes. When I started playing I had experienced coaches who knew how to "feed" the ball to a beginner. So all I needed to do was concentrate on practising my forehand and backhand strokes without having to worry about whether the ball would be in the right place for me to hit it. If you're a beginner and you're just learning how to play, it's important to understand that the modern game has evolved into one that's dominated by attacking / offensive minded players, and that defensive play has diminished significantly. Therefore I would recommend that you learn how to play using an aggressive, attacking style of play rather than any other style.